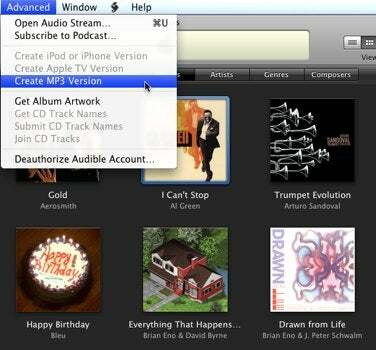 Upgrading to iTunes Plus: Why the hassle? Today’s the day when the music at the iTunes Store is unshackled from the bonds of digital rights management (DRM). And exactly what should you celebrate (or mourn) with this event? Let’s take a look. When Phil Schiller announced variable pricing in January 2009, questions cropped up. Did Apple cave to the recording industry? Will variable pricing mean the end of album-only tracks? Will 69 cents become the norm for back catalog material? My breezy walk through the Store Tuesday morning provides some hints. If you define Apple as caving to the recording industry as prices increasing for new and popular tunes, then yes, Apple caved. On the Store’s home page click the Arrow icon next to the Top Songs heading. In the list that appears, click on the Price column to sort by price. 46 tracks are priced at $1.29. 54 tracks cost 99 cents, and there are no tracks for 69 cents. The iTunes Stores isn’t the only online emporium hit with higher prices. For example, you’ll find Train’s Drops of Jupiter single for $1.29 at both the iTunes Store and Amazon MP3. But Amazon MP3 still offers bargains where the iTunes Store doesn’t. Singles from Rihanna’s Good Girl Gone Bad, for instance, cost $1.29 at the iTunes Store while they’re just 99 cents at Amazon MP3. Lots of $1.29 tracks in today's Top Songs. Album-only tracks seem to be as prevalent as ever. If you were hoping to purchase the 22:53 live version of the Allman Brothers’ Whipping Post for $1.29, you can put that hope behind you. It, and lots of other long tracks, remain album-only. While there are tracks on the Store for 69 cents, it’s not yet clear what makes a track worth that amount or how you easily find these tracks. What is clear is that the Store isn’t blowing out back catalogs. I searched the catalogs of deceased artists Ray Charles, Cat Stevens (deceased in name only), Bing Crosby, and Marvin Gaye. There were no 69 cent tracks for Charles, Stevens, or Crosby and very few Marvin Gaye tracks offered for 69 cents. I then dug into the catalogs of more obscure artists—Petula Clark, Wild Man Fischer, and Aztec Camera. No 69 cent tracks. Apple was reasonably generous with its DRM restrictions—allowing you to play your purchased music on up to five computers, burn it to CD, and play it on an unlimited number of iPods and iPhones—but with restrictions removed, the world is your musical oyster. For example, I have a Sonos Multi-Room Music System I use to pipe music throughout my home. Regrettably, because of Apple’s DRM, I can’t play my protected purchases on the Sonos system. I can play these DRM-free tracks. You can convert purchased tracks to any format you like. And if you have a device incapable of playing AAC files (the format Apple continues to use), you’re welcome to convert these DRM-free tracks to any format you like. To do that, open iTunes’ Preferences window, click the General tab, click the Import Settings button, choose the encoder you want to use from the Import Using menu in the resulting window, click OK, click OK again to dismiss the Preferences window, and choose Advanced -> Create encodername Version. Your music will be encoded to the format you chose. The iTunes Store sells iPhone ringtones—portions of some tracks sold for 99 cents. If you want a ringtone as well as the full version of the track that ringtone is based on, you must purchase both separately. That’s still the case, but now that DRM has been stripped from the Store’s catalog, there’s nothing to stop you from purchasing an entire track and making a ringtone of your own. You can do this with any audio editor capable of editing AAC files, including GarageBand. As a matter of fact, GarageBand includes a Send Ringtone to iTunes command in its Share menu. Just drag a DRM-free purchased track into an empty iTunes track, click the Cycle Region button to cause the Cycle Region bar to appear, drag that region over the area you want as your ringtone (it must be 40 seconds or less), and then use that Send Ringtone to iTunes command to export your ringtone in an iPhone-compatible format. If you haven’t opened GarageBand before, this may provide the incentive to do so. Never purchase another ringtone again. The Store’s DRM-free tracks are AAC files encoded at 256kbps. These tracks are approximately one-fifth the size of the unencoded original. So, for example, a four-minute DRM-free track purchased at the iTunes Store weighs in at 8MB while it’s unencrypted counterpart will be around 40MB. Apple bases its X-numbers-of-tunes-in-your-pocket iPod capacity estimates on AAC files encoded at 128kbps. If you were to fill your iPod with nothing but these DRM-free tracks, you’d find that iPod held half as many tracks. Tuesday was Go Day at the iTunes Store and, try as they might, Apple and the music companies haven’t been able to completely restock the shelves with DRM-free versions of everything the Store had before the transition. From all appearances, everyone’s on board for this to happen, but you may find that tracks you purchased in a protected form aren’t yet available in the DRM-free version.